I’m not afraid to admit that I’m sometimes a little tight with money. I really don’t like throwing our hard earned dollars away, so if I can find a product of equal (in reality, sometimes a lesser) quality, then I’ll generally do so depending on what the product is. The reason I’m bringing this up is because on the weekend, I purchased a genuine sewing accessory; specifically a Brother quarter inch piecing foot with guide. In Australia, we use centimetres and metres so inches and feet was a bit of a jump for me when I made my first quilt. After some research online, I realised you could buy a quarter inch piecing foot where all you would need to do is line up the edge of your fabric with the edge of the foot to get a perfect quarter inch seam (in my case, an almost perfect quarter inch seam). I had a look online for these feet when I first started quilting and saw that genuine Brother ones cost between $20 – 40 AUD, which was a small fortune when, at the time, I wasn’t entirely sure whether I’d be any good at this quilting thing. So I purchased a cheapy on eBay, which didn’t suit my machine, and moved around A LOT, when I sewed. I went to my local craft store to buy some fabric for my new orders over the weekend, and saw that they sold genuine Brother accessories. 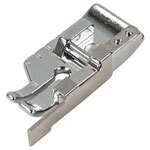 The 1/4″ piecing foot cost $24.95, which really is a small fortune for such a small piece of metal. This is the one I purchased. Because I started piecing my half square triangles on the weekend for my next quilt, I just wanted to share that sometimes it really is worth investing that little bit extra into a genuine, quality sewing accessory. Having used the cheapy one for at least 9 months now, I’m totally kicking myself that I didn’t buy the genuine one from the get go. I used to find that my squares were often a little out, which made getting crisp clean joins a total nightmare, and I believe the reason I found it so hard was because my cheapy foot would bounce around all the time. The same cannot be said for my new 1/4″ piecing foot with guide. It is FANTASTIC! It’s strong, it’s stable, and it doesn’t move around. Using this foot with the guide made piecing 120 HST’s SO blooming easy .. because the foot fits my machine perfectly, seeing as it is a Brother accessory. I think there are plenty of occasions when you can substitute a replica product for a genuine product in the craft world, and we all work so hard to support our craft habits that I can understand why we sometimes choose to buy a cheaper, but inferior product. On this occasion though, I’m glad I invested a few more dollars because it is going to make my sewing journey so much easier. I have a question for all you quilters out there .. Do you use a walking foot for you quilting? The reason I ask is because I purchased a walking foot on eBay which is not a genuine product. I tried quilting with it on my sewing machine for my second ever quilt, and it was a nightmare, so I previously used my cheapy piecing foot. My local craft store sells the genuine Brother walking foot for my machine for about $54.95, which I feel is a big investment for something so small .. Are walking feet really necessary for quilting? Do you think I’ll find quilting easier if I use a walking foot? I would really love to hear your opinion! Hi, Erin: my machine comes with a built in walking foot, and I use it every time I piece a quilt. It’s totally worth it for piecing. I don’t always use it for free motion quilting, but definitely for straight line quilting or stitching my blocks in the ditch to help stabilize the layers for FMQ. If you plan to quilt over the long term, I’d say it’s worth the investment. Good luck! Oh lovely! I wish mine did .. I have to purchase as a seperate accessory, and I’m pleased to say that I purchased a genuine one on the weekend! Thanks to your advice and some comments and feedback I’ve read online. I’d like to keep quilting, so as you suggested, decided to take the plunge :) Thank you for stopping by!